Haiti Moves A Step Closer Toward Eradicating Elephantiasis : Shots - Health News Despite the daunting health challenges Haiti faces, the country has achieved a major step toward eliminating the parasitic infection, which causes severe swelling of the legs. Haiti is on track to wipe out the disease within four years, scientists say. Boys at the L'Ecole Les Freres Clement elementary school in Jacmel, Haiti, line up to take deworming pills that protect against elephantiasis. Haiti has finally carried out a nationwide campaign to get rid of the parasitic worms that cause elephantiasis. Haiti has waged other campaigns against the condition, characterized by severe disfiguration of the legs and arms. But until now, it has never managed to adequately reach residents of the chaotic capital Port-au-Prince. The latest effort by the Haitian Ministry of Health now puts the country on track to wipe out elephantiasis within the next four years, says a study published in the Morbidity and Mortality Weekly Report. Two women with elephantiasis wait at a hospital in Leogane, Haiti, in May 2012. Elephantiasis — officially called lymphatic filariasis — is a cruel condition. Parasites invade your lymphatic system and cause grotesque swelling, primarily of the legs, but also, at times, of the arms and scrotum. 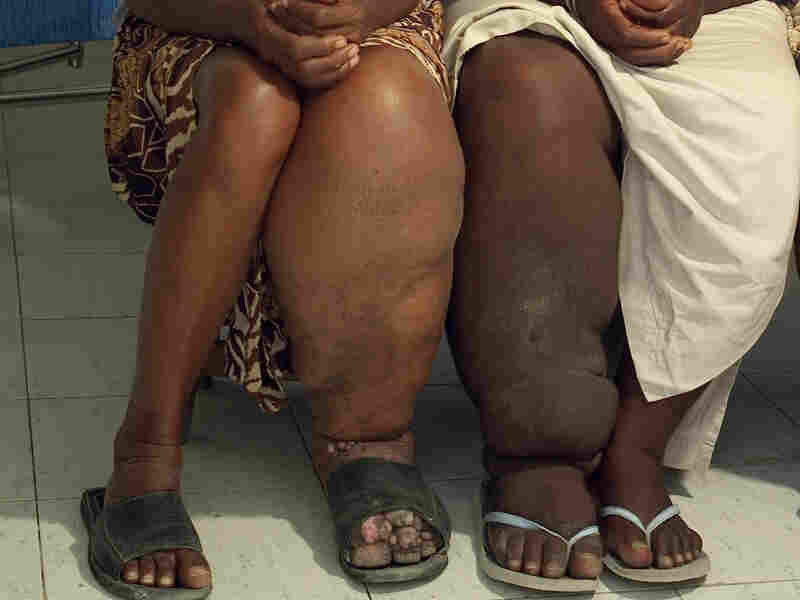 In some parts of the world, lymphatic filariasis is called "big foot." But even this term downplays the extent of the disfiguration it creates. Elephantiasis can cause massive folds of excess flesh to hang from a person's hips, thighs and calves and sag toward the ankles. It can make a man's scrotum swell to the size of a basketball. People are the only known host for the roundworms that causes elephantiasis. The fight against the disease focuses on mass deworming campaigns. In Haiti that means getting everyone to swallow two pills. The idea is that if you can get 65 percent of the population dewormed for several years in a row, the parasites can no longer survive in the community, and they disappear for good. Until now, Haiti hasn't been able to reach the 65 percent threshold in Port-au-Prince, a metropolitan center with more than 2 million people. 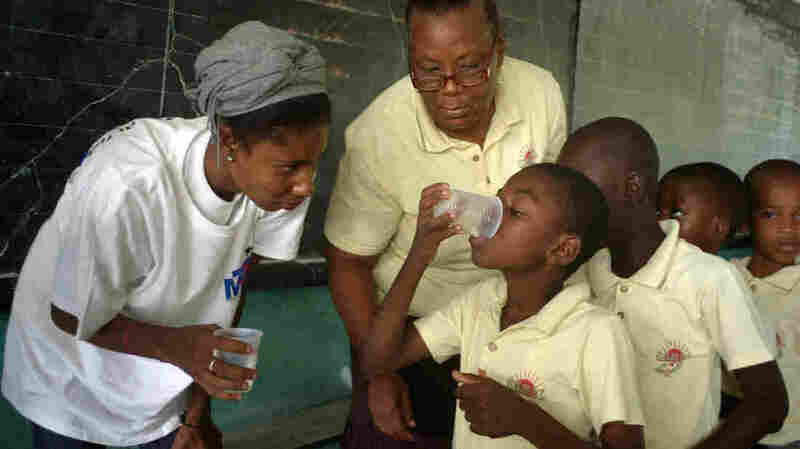 The mass distribution of deworming pills will have to continue for another four years before health workers are confident that the parasite has been eliminated from Haiti. The University of Florida's Dr. Madsen Beau de Rochars has been treating Haitians with elephantiasis for nearly two decades. He says the condition can be devastating. "It's a big burden economically and physically for that person," says Beau de Rochars, who worked on the current study. People with the illness are often ostracized. Haiti is one of just four countries in the Americas where elephantiasis remains endemic. It's also still found in parts of Brazil, the Dominican Republic and Guyana. The successful deworming campaign in Haiti is a major step forward not just for the country but for the whole region, says Patrick Lammie, an immunologist with the Centers for Disease Control and Prevention, who also contributed to the current study. "If a country like Haiti, with all of the challenges that they've faced over the last few years, is able to achieve full national coverage, I think that is as an important example for other countries, which are struggling to scale up their programs as well," he says. Eliminating elephantiasis in Haiti would also help the Dominican Republic control the disease. Beau de Rochars is confident that Haiti will wipe out elephantiasis eventually. "I had a dream back in 1995 when I first started working in lymphatic filariasis," he says. "And my dream is to see the certification of elimination [of lymphatic filariasis] in Haiti. This is my dream. I'm a Christian and I believe God will help me to see that."